Hi there. Back at it again on how we eat. Nutrition varies from person to person even though we all, all us trainers that is, have similar goals in mind – boost performance, optimize health. Here are the collective responses to what we normally eat, where we shop, and how we prepare our food. Spinach, kale, salad greens, chicken, eggs, sweet potatoes, fruit, quality animal proteins, a lot of fresh produce and coffee. 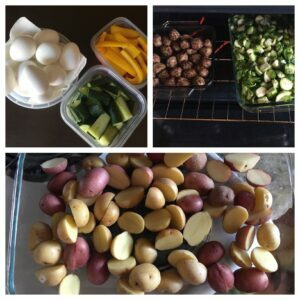 Food prepping is what some call the key to success in eating right. Some of us prep all of our meals ahead of time. For those who prep for the week says it takes about 1-3 hours. Cooking meat, veggies, and carbohydrates ahead of time makes it easier to pack healthy meals for the week so you are not scrambling when you are hungry. This can be done by using the same protein but for different types of meals. Example: Chicken. You can use chicken as your main part of your meal, or you can chop it up for a salad or put it in your favorite soup. Also, you can double the protein you make and freeze the rest so that it will be already prepared towards the end of the week. Having variety in meals will prevent you from getting bored with what you eat. Explore with different sides and proteins. •First, when possible, select restaurants that facilitate eating the way you intend. •In terms of indulgences- be intentional ie. ‘I’m going to have a piece of bread because it is fresh, warm and smells delicious AND I’m going to savor and enjoy every bite without a trace of guilt because I don’t have this very often.’ Same with dessert. To that end, try to overcome any feelings of scarcity (I have to eat every bite because who knows when I will have this again) by replacing with mindfulness and thorough enjoyment until it’s no longer offering the same satisfaction – very often this will occur long before the serving has been completed. Remember the occasional indulgence is fine and should be enjoyed, it’s overindulgence in terms of quantity and/or frequency that gets us off track. Have other tips or strategies that have helped you be successful? Please share in the comments below! If you found these practical tips helpful and would like to discuss your personal nutrition goals or challenges in more detail, FiT offers 1 on 1 nutrition consultations. Contact the front desk for more information. This entry was posted in Active Living, Eating Strategy, Health, Healthy Lifestyle, Hydration, In the Kitchen, Inspiration, Mental Well-being, Menu, Resources, Tips and tagged active living, eating out tips, health, health lifestyle, in the kitchen, inspiration, meal prep, menu, nutrition, resources, tips.